Recently I introduced Kanban to an inflight development project with the objective of trialling this technique with a hope to raising productivity by overcoming various communication and process issues. In this three part series I’ll cover my real world experiences and the results felt by the project/team. This first part offers an introduction to Kanban, part 2 will cover the results obtained by introducing it to an in-flight project and part 3 will give some fuel to the “Physical versus Virtual Kanban boards” debate. Kanban is not a methodology but an enabler to the goal of Continuous Improvement: The Kanban Method encourages small continuous, incremental and evolutionary workflow changes that stick over time. When teams have a shared understanding about the flow of work they are more likely to be able to build a shared comprehension of a problem and then suggest improvements that can be agreed by team consensus. Visualization of work has become very popular in agile development practices. XP, for example, has “informative workspaces” that display project progress at a glance and the use of “Information Radiators” is gaining ground (i.e. graphs or charts on the wall showing graphically the work in progress within the team or project. This work is too often hidden and so by publicizing the flow of work we can start to understand the real processes in place and how work flows to completion. Once you have that understanding (and can easily share it) you can start to make improvements. Kanban development revolves around a visual task-board used for managing work in progress: A progress board but with rules! The columns on the board represent the different states or steps in the workflow and the cards/post-it-notes represent a unit of work (the feature/user story/task etc.). We then move the cards along the board through each process stage (i.e. column) to completion. A look at the board at any one time shows which items of work are currently within each stage of the process. In order to limit the concurrent work in progress within the team we add rules to the Kanban board and set WIP limits on each column, e.g. only 6 items can be in QA at any one time as that is the max capacity of that team. No more work can be assigned to the QA queue whilst it is full. This limit enforces that new work is only “pulled” into the QA queue when there is available capacity. This immediately reveals the bottlenecks in your process so that they may be addressed. Once we spot a bottleneck we stop adding more work to the bottlenecked queue and collaborate within the team to eliminate the blockage (e.g. move resources off build tasks and onto QA tasks). It’s important to note here that we are not artificially introducing a limit here, as we have created the board initially based on the current workflow and therefore the limit exists in reality (e.g. only a single team member can perform part of the process) but it may not have been currently visible to the team. A critical benefit of Kanban is that it is very simple to implement, use and improve. Knocking up a task board on your current process is straight forward and team members soon pick up the approach which really aids team engagement. In addition as it is not a methodology in its self it can be used within your existing methodology and actually provides a more gradual evolutionary path from Waterfall to Agile. It is also less dependent on cross functional teams than Scrum. 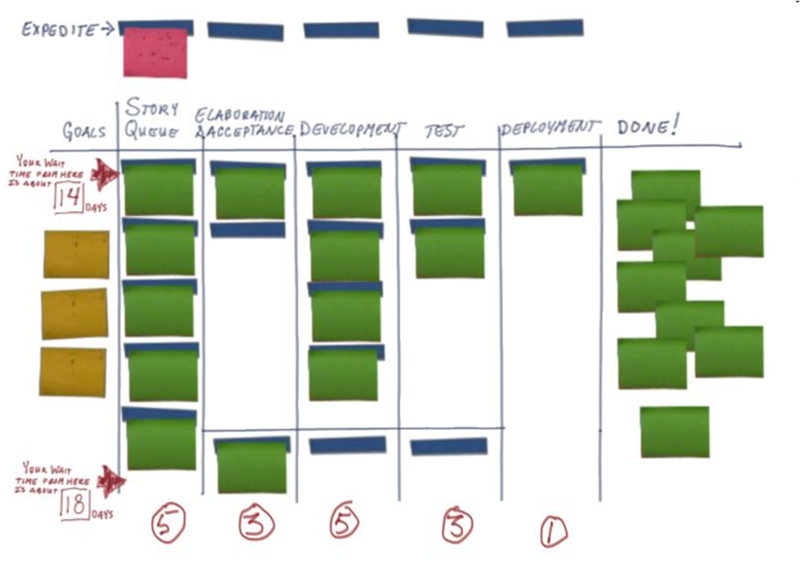 Using Kanban to manage tasks within the Design, Build and Test phases of a Waterfall project can prove very successful regardless of the wider methodologies in use. In addition, the ability for it to handle irregular, ad-hoc work makes it also especially good for managing defect resolutions within a build team or for a Operations/Service team handling incidents. A 2010 case study with the BBC Worldwide team using Lean methods including Kanban recorded a 37% increase in lead time improvement, a 47% increase in delivery consistency and a 24% drop in defects reported. This was not all due to Kanban, but Kanban appears to have been a key ingredient together with smaller batch sizes, stand-ups and an empowered team. That’s an excellent introduction to Kanban. We would like to republish it on PM Hut where many project managers will benefit from it. 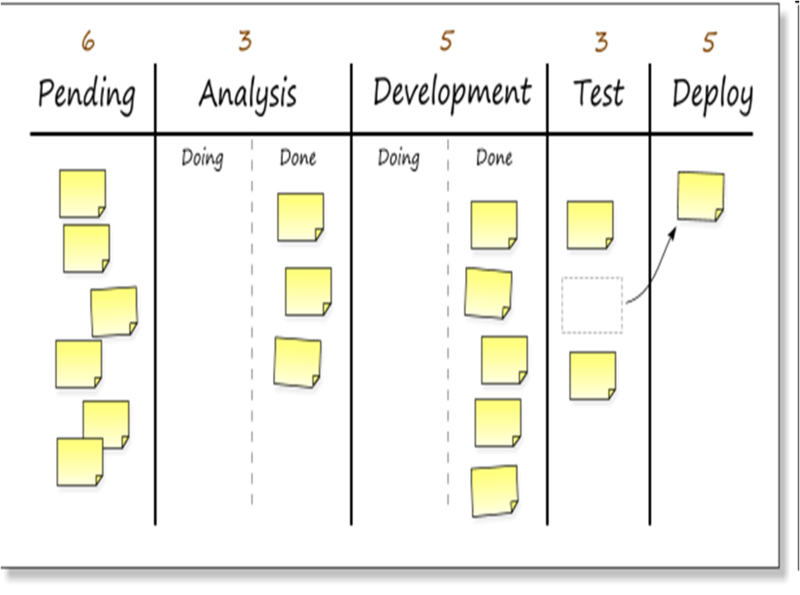 (We have published articles on Kanban before, such as this one, from scrum to kanban). Please email us or contact us by using the contact us form on the PM Hut website in case you’re OK with this. Great overview on the concepts behind Kanban and why it is also such a great fit for the software and app development space. If it is ok with you I’d like to feature your article during the onboarding process of our lean product management tool. I think your thoughts are a perfect fit to help teams who are just getting started with Kanban and want to understand the philosophy behind it. Happy for you to use the article. Your product looks very interesting.